Today, Lily Sanders can point to extraordinary successes of being named one of the top 15 coaching experts in New York City, years as a soap opera regular and TV/movie dancer and actress, multiple-franchise owner, devoted mother and even a year as a featured Barnum & Bailey Circus show dancer! But it was the lowlights, not the highlights, that have defined and refined her. Looking at it objectively, Lily's life sounds like a sad country song. Its refrain began early when she was very young, living with a depressed frightened mother, three siblings and an abusive father, who made life a living hell for the children and wife who helplessly watched. Lily endured until relief came when he departed, but that left her to be the adult to her childlike mother. It was through dance that she first found her footing. Passionately engaged, she could forget about everything else and just dance! And that was her ticket away from home for the first time, going on the road with the circus, learning tough lessons and standing on her own. Eventually, she pursued the life of a professional dancer, auditioning and getting TV, movie and theatre opportunities that blossomed ultimately into success as an actress. And then further success in business. But it was her private life that proved to be her real crucible. Repeatedly aligning herself with damaged men, she found herself once again emotionally and physically abused. And then in a life-long custody wrangle with her ex-husband over her beloved son. But she knew she had to break the pattern. So she started with herself. Truth to Triumph: A Spiritual Guide to Finding Your Truth is the story of how she found her truth, how she forged a new relationship with her higher self and the Divine to be a beacon of love for those to follow. Her book is far more than a chronicle of her life and her transformation...it is filled with guidance, wisdom and advice for any woman who is struggling to find her way, to find peace, love, contentment and prosperity. It is steeped in insights, hard truths, gentle encouragement, inspiration, spiritual doorways, darkness-defeating honesty and authenticity. Lily wants to lift up her sisters so they may never have to just endure - they can thrive! 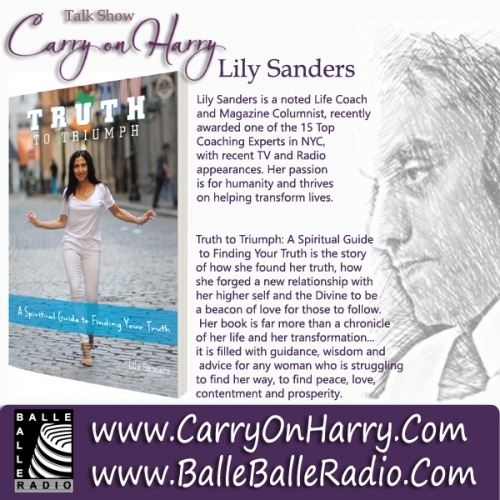 Today, having a highly successful coaching practice in New York, and being a sought after TV and radio guest and workshop leader, Lily Sanders is transforming the lives and hearts of woman across the nation. Stay tuned for talk with Lily Sanders with show host Harry Johal .